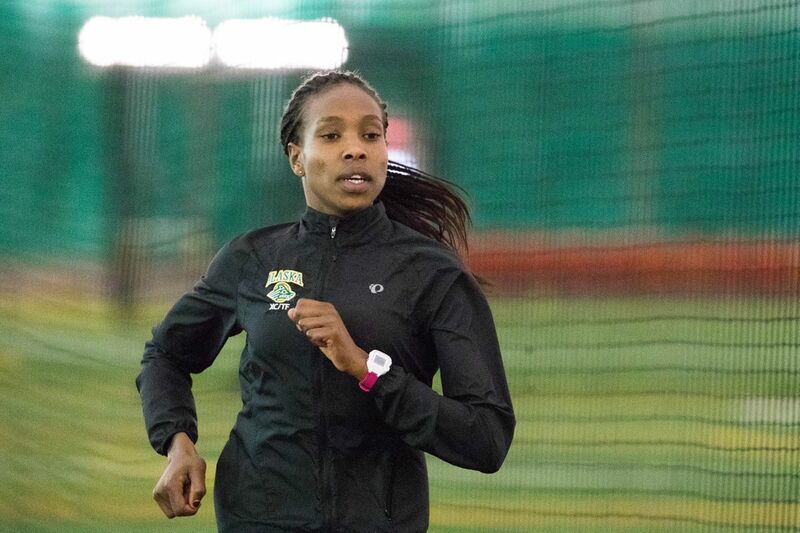 UAA running sensation Caroline Kurgat made it easy for officials to pick the women's athlete of the meet Saturday at the Great Northwest Athletic Conference track and field championships. After blazing to a meet and track record in the 10,000 meters Friday in Monmouth, Oregon, Kurgat on Saturday won the 5,000 meters and came up one-tenth of a second shy of victory in the 1,500 meters. Kurgat scored 28 of UAA's 100 points, which gave the Seawolves fifth place in the women's team standings. Seattle Pacific won with 154.5 points. The men placed seventh with 72 points. Concordia took the title with 138 points. In addition to Kurgat's achievements, the Seawolves boasted four other meet champions and 18 top-8 finishes. — New Zealand's Chris Brake, who soared 6 feet, 7.5 inches to win the men's high jump. Brake finished the two-day meet with three top-5 finishes — he was third in triple jump (46-2) and fifth in the long jump (21-11). — The men's 1,600 relay team of Nicholas Taylor, Darrion Gray, Daniel Remington and Liam Lindsay triumphed in 3:14.21. Lindsay added individual finishes of fourth place in the 400 (48.71) and fifth place in the 200 (21.86), and Gray grabbed third place in the 200 (21.55) and sixth in the 100 (10.88). On Friday, Kurgat won the 10,000 in 34 minutes, 49.33 seconds to break a 10-year McArthur Field stadium record and a four-year GNAC championships record. Although the time was well off her personal-best of 32:33.24 from earlier this season, Kurgat was more than two minutes ahead of second-place Sophia Galvez of Western Washington. Her effort sliced 45 seconds off the previous McArthur Field record of 35:34.05, set in 2008 by Lorene Young, and took nearly a minute off the previous GNAC championships record of 35:43.38, set in 2014 by UAA's Joyce Chelimo. Kurgat, a junior from Kenya who is running some of the fastest times in Division II history, returned to the track Saturday for another dominating performance. She won the 5,000 by 15 seconds in 16:53.43, and was a close second in the 1,500, where her time of 4:24.68 left her less than one-tenth of a second behind winner Addy Townsend of Simon Fraser (4:24.59). Marie Ries, second in the 200 (24.74) and third in the 100 (12.27); Emma Chelimo, second in the 3,000-meter steeplechase (10:49.33) and seventh in the 5,000 (17:33.78); Akeilia Knight, fourth in the 400 (56.41); Mariah Burroughs, fifth in the steeplechase (11:06.60); and Tamara Perez, sixth in the 1,500 (4:37.21). Brandon Nicholson, second in the triple jump (46-10.25); Oshane Hylton, third in the 100 (10.65); Nickson Koech, third in the 10,000 (32:12.47); and Kaleb Korta, sixth in the 3,000 steeplechase (9:13.88) and eighth in the 1,500 (3:58.64).